Justice Department Antitrust Chief Makan Delrahim appeared in the courtroom Thursday to watch the proceedings in the government's lawsuit to stop AT&T's bid to purchase Time Warner as attorneys honed in on another merger: Comcast and NBCUniversal. Besides his attendance at opening statements, it was the second time Delrahim showed up in the courtroom to observe witness testimony. Last week, he arrived to watch Comcast executive Greg Rigdon testify, but in an interview with CNN outside the courtroom, Delrahim said not to read too much into the fact he appeared on days that involved Comcast discussions. "I try to see what I can. I've got other responsibilities as you know, other transactions, but this is an important case so I come when I can," Delrahim said. Two AT&T executives testified Thursday about how they prepared for the expiration of the settlement conditions imposed on the Comcast-NBCUniversal deal, which was the last mega media merger akin to AT&T's $85 billion purchase of Time Warner occurred. Time Warner is CNN's parent company. One key difference between how the Comcast and NBC deal worked out is that the Justice Department did not sue to stop Comcast's purchase of NBC, instead reaching a settlement agreement that was ultimately approved by the same judge presiding over the AT&T case, Richard J. Leon. The settlement included certain conditions that Comcast and NBC had to adhere to for seven years, including a commitment from Comcast to not withhold NBC programming from distributors during disputes. Comcast would also have to enter arbitration should any disputes arise with distributors. But those conditions expire this September. During testimony on Thursday, Justice Department lead attorney Craig Conrath sought to highlight how AT&T and DirecTV executives prepared for the expiration of those consent decrees, pointing to the companies' internal strategy documents that detailed what would happen in the industry once Comcast and NBC were free from the restrictions. The Justice Department has sued to stop AT&T's $85 billion purchase of Time Warner, claiming it will use increased bargaining leverage to raise rivals' costs, limit competition and stifle innovation. AT&T has argued that prices would not necessarily go up, that it would have no reason to keep its content from competitors and that the acquisition is necessary for AT&T to compete with the likes of Facebook, Apple, Amazon, Netflix and Google. One strategy document, introduced during the testimony of AT&T Vice President of Strategy and Business Development Timothy Gibson, said Comcast and NBC would have the option to "raise prices or withhold content" or withhold "specific rights" related to the content. The document also said that, without the arbitration agreement, Comcast and NBC could "play hardball" and "threaten blackouts," and could "choose not to license online to some players and discriminate on price." Gibson testified on cross examination by AT&T and Time Warner attorney Katrina Robson that the strategy document government attorneys read from was an early draft that was later reviewed by legal and regulatory experts who removed those portions. "They changed dramatically," he said. Gibson said the document specifically says that it's a "preliminary draft" and cited a label that indicated it was written with only the "strategy group's opinion." Leon asked Gibson if these types of documents with a disclaimer are common and created for internal use only, to which Gibson said they are. Earlier, Justice Department attorney Eric Welsh asked AT&T executive Daniel York about the company's plans in 2016 to wait until the consent decrees in the Comcast case expired before moving forward with a deal with an unnamed programmer. Welsh pointed to an email from 2016 in which York wrote that the consent decree conditions "keep the reins on [Comcast] at least philosophically." After Welsh concluded questioning York, Delrahim flashed Welsh a thumbs-up. He later told CNN that he did so because it was "a phenomenal redirect" with an "interesting witness." "[The trial] is going as well as any antitrust case can be going," Delrahim added. There have been some questions as to whether the Justice Department will seek to extend Comcast's consent decree. In December, Democratic Sen. Richard Blumenthal asked the department to go back and take another look at the settlement. Delrahim also told CNN it sounds like Leon wants the case "wrapped up," adding that he thinks the trial will conclude by the end of April. Leon previously told both sides to speed up the proceedings, warning that if they don't conclude before May, he will not be able to issue his opinion on the case before AT&T and Time Warner's merger deadline on June 21. "We wanted a great a judge, and we have a great judge," Delrahim said. In the afternoon, Justice Department lawyer Julie Elmer questioned a director in corporate strategy at AT&T, Gregory Manty, who has been working on a post-merger content distribution strategy. Elmer pointed to 2017 emails between people on the corporate strategy team in which Manty said the AT&T and Time Warner combination "will ensure the stability in the slow decline of the industry" and that the traditional pay TV format "will be a cash cow business for AT&T for years to come." 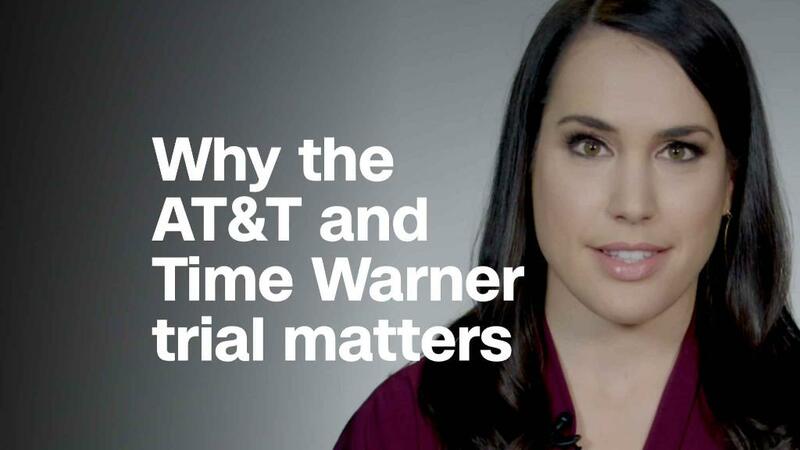 The government tried to get several more emails and PowerPoint slides admitted into evidence but Judge Leon continuously sustained AT&T and Time Warner lawyers' objections. Correction: An earlier version of this article misstated what the AT&T executives testified about regarding the Comcast and NBCUniversal merger. Their testimony dealt with how AT&T prepared for the expiration of the conditions imposed on Comcast and NBCUniversal due to their settlement with the government, not the merger itself.